Last season, the Huskies finished dead last against the pass and showed no improvement against the Knights last Thursday at the Rent. QB McKenzie Milton burned UConn for five touchdown passes. The Huskies fly across the country to Boise, Idaho to take on the Broncos. Senior Brett Rypien began his final season with 60 career aerial strikes and tossed four more last week versus Troy. It is easy pickings for the Broncos’ signal caller on Saturday as he passes for over 300 yards and lobs another four touchdowns. CFF diehards across the nation looked forward to the debut of Adrian Martinez in a Cornhuskers’ uniform last week, but the game against Akron was cancelled. Nebraska hosts the Colorado Buffaloes, and Vegas expects the two teams to combine for at least eight touchdowns. A dual-threat playmaker, Martinez earned the starter’s role in training camp, and Coach Scott Frost’s offense can light up the scoreboard when firing on all cylinders. The freshman field general rushes for over 75 yards, passes for more than 180 yards and produces at least three touchdowns this weekend. Grab Martinez off the waiver wire before his break out game occurs. I profiled Shawn Robinson in my CFF Sleepers column, and astute diehards drafted the Horned Frogs’ rising star over the summer. Shockingly, he is still on 58% of waiver wires after producing five touchdowns against the Southern Jaguars. Coach Gary Patterson is not shy about running up the score versus in-state rival SMU. The Horned Frogs have won five straight contests against the Mustangs, and in the past four games, have outscored SMU 201-76. In 2014 and 2015, QB Trevone Boykin produced 12 total touchdowns and passed for 734 yards, and in the last two contests, QB Kenny Hill tossed six aerial strikes and recorded 817 passing yards. Robinson is the next signal caller to manufacture prodigious stats in this rivalry and leads the TCU offense to another huge output. Anytime a runner suits up in a game with a projected 71 points scored, CFF owners must start the ball carrier in their lineups. In 2017, Darrell Henderson averaged a whopping 8.9 yards per attempt and exceeded 1,000-yards rushing. Against Mercer, the junior only had his number called nine times but produced 76 yards rushing and scored. He also added a 62-yard touchdown catch. The point spread foreshadows a close contest with both teams scoring over 33 points. During his career, Henderson has never earned more than 15 carries in a game; nevertheless, he should set a new career best against Navy on Saturday. Insert Henderson with confidence into your starting lineup. After being embarrassed by the Notre Dame front seven last week, the Michigan offensive line has surely been challenged (and insulted) in practice by Coach Jim Harbaugh. The Wolverines fell behind and put the ball in the air 36 times: Not a formula for success in Harbaugh’s system. 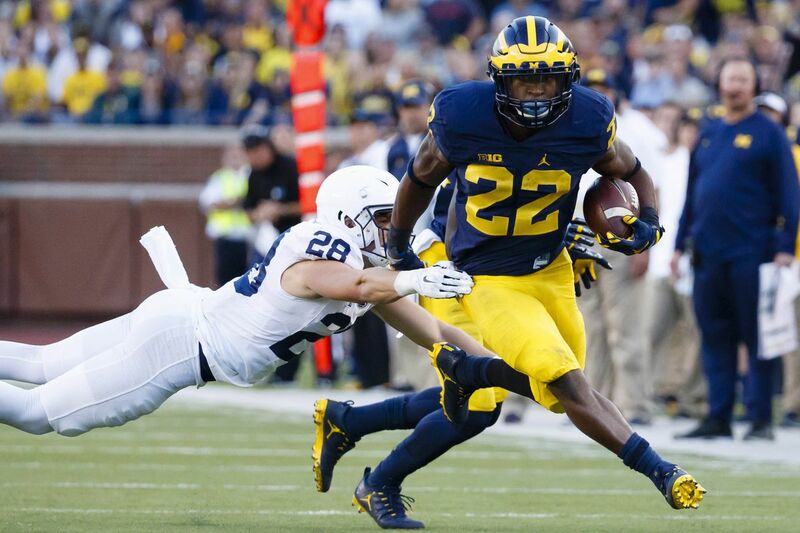 One of four captains, Karan Higdon carried the football 21 times and appears to be the big dog in Ann Arbor for now. Last year, the senior totaled 200 yards rushing twice and recorded 158 yards in another game. Higdon did not exceed the century mark in any other contest. He is a risky start but Western Michigan provides a terrific matchup. The Broncos surrendered 334 rushing yards versus Syracuse (Eric Dungey recorded 200) and will have a difficult time slowing down an angry Wolverines O-line on the road. Higdon earns 25 carries and reaches the end zone a couple of times on Saturday. Against FCS opponent UC Davis, San Jose State suffered a 44-38 loss and allowed RB Ulonzo Gilliam to ramble for 132 yards rushing, catch eight passes and score three times. Against Wyoming, senior James Williams paced the Cougars with 16 carries for 82 yards and snatched 10 passes for 53 yards. He also scored twice. In 2017, the Spartans ranked last against the run, allowing 285.4 yards per game and surrendering 40 touchdowns on the ground. It does not appear that San Jose improved over the offseason. Williams certainly scores over 20 points in ppr-scoring formats before resting in the second half of the game. East Carolina fell at home against FCS foe North Carolina AT&T on Monday. The Aggies wide receivers—Elijah Bell, Malik Wilson and Zachary Leslie—combined for 15 catches for 171 yards and three touchdowns. On Saturday, the Pirates welcome the Tar Heels to town. At 6-foot-1 and 205 pounds, Anthony Ratliff-Williams, who snatched only three passes for 62 yards and a touchdown against California, presents a physical mismatch for the much smaller East Carolina corners. Las Vegas expects five touchdowns for the Tar Heels, and the junior playmaker reaches the promised land again with 6 catches for over 100 yards. As a 30-year fantasy football veteran, I have never shied away from starting a dynamic quarterback-receiver duo in lineups when the matchup foreshadowed a scoring bonanza. In the late 1980s, my first combo was Dan Marino and Mark Clayton, and Carson Palmer and Chad Johnson provided so many fireworks on my teams 15 years later. In college fantasy football, Tim Tebow and Percy Harvin decorated my first CFF roster, and two years ago, I enjoyed Ben Hicks and Courtland Sutton hooking up for a few big outings. This week I am willing to insert Jalen Reagor along with Shawn Robinson against my opponent: The two should combine for seven receptions for over 100 yards and a touchdown against the Mustangs. The season is in its infancy, but it is clear that the Colorado State secondary cannot stop opponents. Over their first two games of the crusade, the Rams have been torched for over 750 yards and seven touchdowns. The Razorbacks’ new Coach Chad Morris implemented his up-tempo passing attack, and it paid dividends immediately last week, scoring 55 points against Eastern Illinois. Sophomore Jordan Jones exploded for five receptions for 132 yards and a touchdown. He is criminally under owned (3%) in CFF leagues and should be acquired immediately. QB Ty Storey continues to target Jones, and he surpasses the century mark in back-to-back contests for Arkansas.